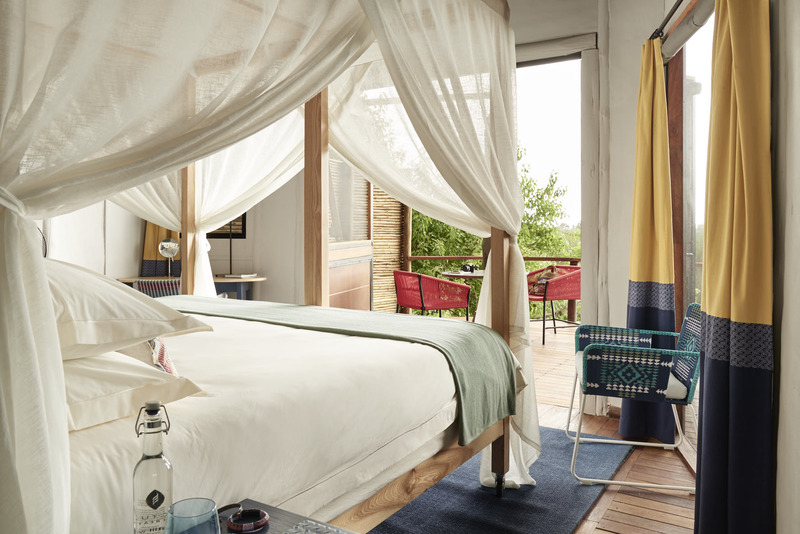 Perched above the Boro River in a private concession bordering the Moremi Game Reserve, Sanctuary Baines’ Camp and its stilted, standalone suites have been transformed with larger spaces, extended decking, welcoming in the surrounding wilderness, and bold artistic interiors. 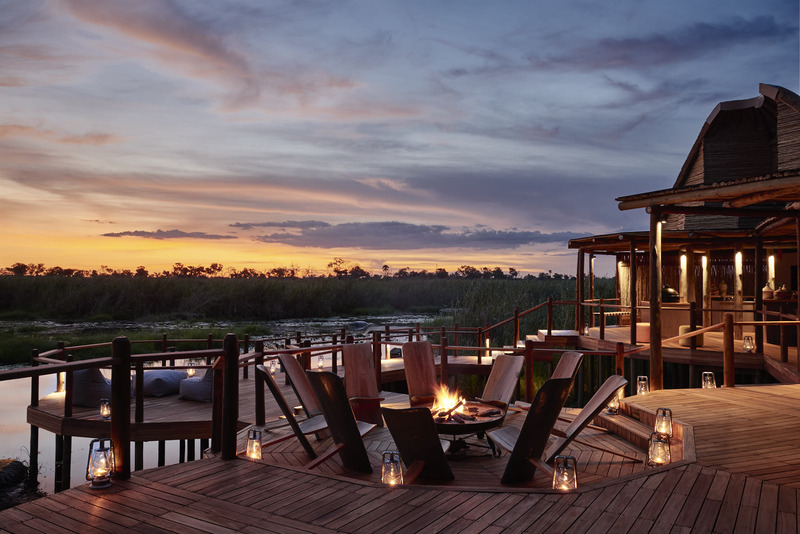 This papyrus-framed luxury camp doesn’t simply overlook the world-famous Okavango Delta, it ensures guests feel fully part of this extraordinary wildlife-rich ecosystem where desert meets wetland. The six raised abodes at this very boutique camp have light and airy bedrooms opening out onto curved terraces overlooking the river. As intimate as this light-footed camp feels, there’s still an impressive sense of scale with high windows letting in the bright African sun and framing those endless Delta horizons. Connecting so deeply with nature couldn’t be more effortless or relaxing, and couples will relish the feeling of sharing this only with one another. 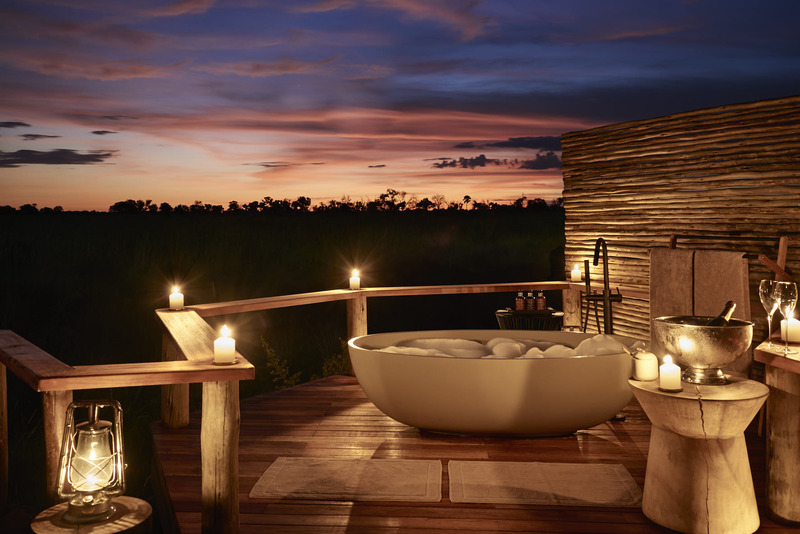 After an exhilarating game drive, returning at dusk, nothing is more tranquil than an indulgent soak in the Star Bath, a unique freestanding bathtub on each private terrace, now a permanent feature. The suites’ four-poster beds roll out for guests to sleep under the clear, starry Delta night skies and hear the murmur of the river and hum of the nocturnal creatures, another unique feature of the camp. Discover a world entirely interconnected by wooden walkways – greet the hippos and step straight from the camp’s jetty into a boat. Follow the raised boardwalks and find communal spaces encircling a sculptural earth formation and rising acacia thorn tree. A colourful lounge with cool hanging chairs and intimate seating areas tugs you in one direction, while alfresco dining awaits in the other. Come evening, guests head to the boma to sip on freshly-made cocktails from the bar and unwind by the glow of the fire before sitting down to an expertly prepared meal abundant with African spices and flavours. 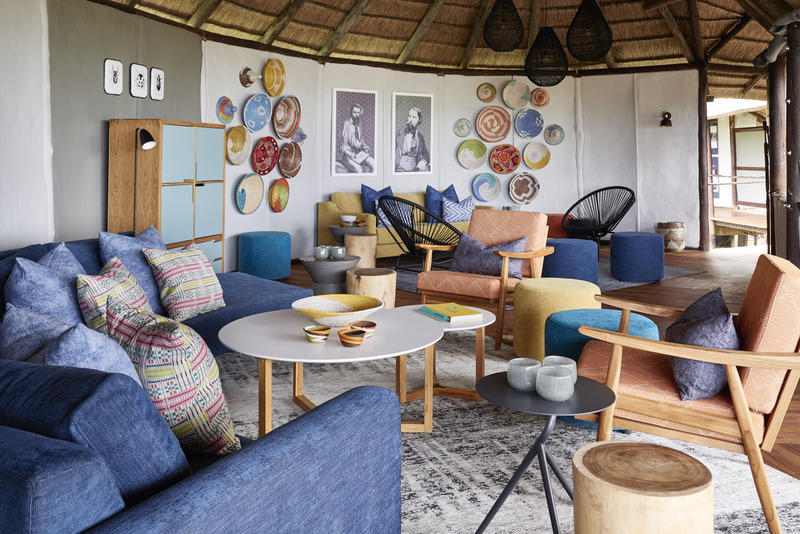 Hand-woven rugs, batik-dyed fabrics, characterful ceramics and basket-weave lights inspired by indigenous handicrafts channel the energy and colours of Botswanan culture. This destination’s history and geography is documented through the work of artist, cartographer and explorer, Thomas Baines. Contemporary black-and-white photographs capture and convey some of the native flora and fauna that enliven this awe-inspiring region, along with Pop Art-style African crafts enhancing the storytelling and all-sensory experience. Safaris in this biodiverse region allow guests to learn about the ecosystem and conservation practices. During the Okavango flood season, traditional mokoro rides can be arranged - keep eyes peeled for the swamp-adapted rare red lechwe antelope, painted reed frogs and slaty egrets. Walk with orphaned elephants, Jabu and Morula, through the bush, guided by renowned specialists Doug and Sandi Groves, watching the animals forage, wallow and amble - together with the Living with Elephants Foundation, Sanctuary Baines' Camp works to secure the long-term future of these majestic giants.